JANUARY 2014 • FOODSERVICE EQUIPMENT & SUPPLIES • 73 off-load the dishes, plates, glasses and serviceware onto a breakdown dishtable. The dishtable features belts that make for easier loading of dish racks and rollers for glass and cup racks, all of which moves into the four-tank, water-effcient fight-type dishmachine. Staff wash carts at an adjacent sta- tion. The large dishwashing area also contains a large pot and pan wash/soaking area. A clean storage area nearby (but separated from the dirty area) holds smallwares until needed for the next production cycle. In addition to the high-effciency, low-fow dishmachine, the kitchen uses energy-effcient refrigeration equipment. The computerized hood system contains variable-speed air systems that monitor the exhaust emitted from the food and adjust the cubic feet per minute (CFM) accordingly. In order to cut down on disposable usage, foodservice staff encourage customers to bring the hospital's logoed mugs to the market and receive free coffee. The market uses eco-friendly disposables, and the restaurant serves meals on china. Lessons Learned "We learned from the Centers for Medicaid and Medical Services (CMS) that we can't dry broom anything," Poggas says. "And how do you do that in a kitchen? We're working with the state health department to fnd a solution that meets both our needs." 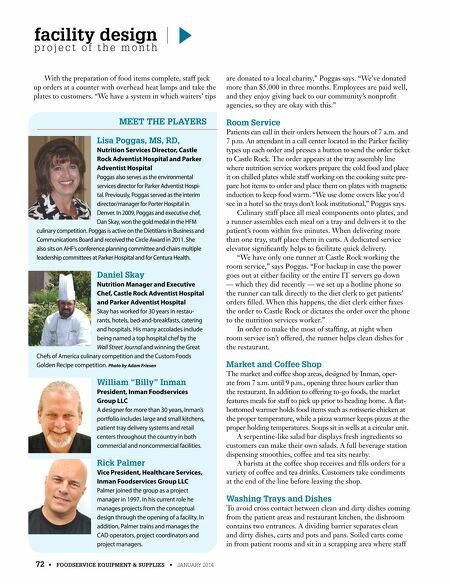 Poggas advises other healthcare foodservice operators to "always have back-up [PRN – as needed] staff." She says more soft openings would have been preferable. "We could have done more work with the cooks and waitstaff to quicken meal prepa- ration and delivery," Poggas says. "Success depends on training, training, training and communication. And having as-needed folks in the wings because unexpected things happen, like staff going on leave. We were behind the eight ball and opened up with low staffng." (Pogga expected bo have a full staff in place by the end of December) Fiscal responsibility was a priority from the project's inception. "We had to be sure the project is fscally sound," Poggas says. Due to the popularity of the food and style of service, Poggas and Skay say the project remains on budget. To meet future needs, Castle Rock can expand the kitchen's walk-in freezer and coolers into space that sits adjacent to the existing equipment. Restaurant seating also can expand to outdoor space. Customer satisfaction remains strong since the opening despite some snafus and the expected problems that come with a new operation. The main complaint Poggas receives is that the restaurant prices are too low. "We must cater to staff, and they expect affordable food," she says. "I don't like to offer discounts because nonstaffers end up paying for staff meals." In coming months, incentives for employees to minimize their healthcare insurance costs will continue. As part of the Café Well project, everyone who takes the hospital's insur- ance receives a biometric screening to check body mass index (BMI), cholesterol, blood pressure, weight, blood sugar and smoking habits. If these are out of range or if an employee doesn't take the screening, they pay more for insurance. If they participate in activities such as weight management or wellness coaching, however, they receive credits toward decreasing their premium costs. In addition, the hospital is part of Partnership for Healthier America and will continue to reach goals of cutting out all fried food, eliminating sugary beverages and keeping sodium levels for entrées at less than 800 milligrams, a very challenging task. Also in coming months, Poggas, Skay and the culinary team will have a clearer sense of which menu items are most popular and how to make the best use of their seasonal ingredients. With the array of equipment they have to work with, making changes is only a matter of imagination and willingness to be fexible. These are in great supply along with a strong desire to add a new dimension to the changing healthcare paradigm here and across the country. 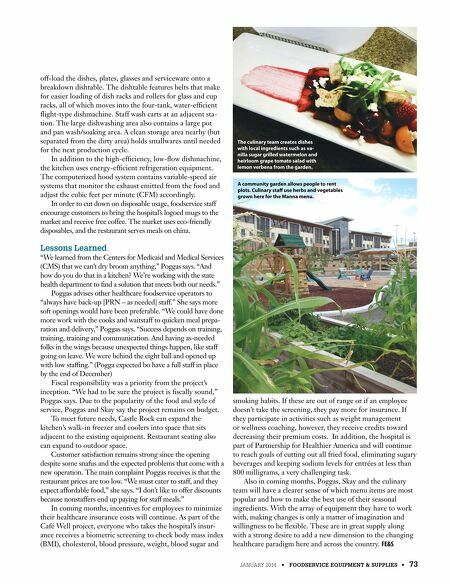 FE&S The culinary team creates dishes with local ingredients such as va- nilla sugar grilled watermelon and heirloom grape tomato salad with lemon verbena from the garden. A community garden allows people to rent plots. Culinary staf use herbs and vegetables grown here for the Manna menu.